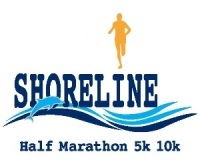 The 2019 Shoreline Marathon, Half Marathon, 5K and 10K are planned for Sunday, July 14th at the Emma Wood State Beach Group Campgrounds. Start at Emma Wood State Beach Group Campground head onto the bike path, bike path leads you onto HWY-1 beachfront bike path. All runners will stay on the bike path or shoulder (ocean side) of Highway 1 along the route. turn around at the designated turnaround point at approx 6.55 mile mark and back towards the finish line the same way you came out. Marathon starts at 7am, half marathon starts at 7:15 a.m., 10K at 7:30 a.m. and 5K at 7:45 a.m.
For more information and to register, visit www.shorelinemarathon.com.